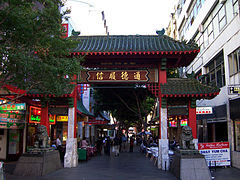 Chinatowns in Australia exist in most states and capital cities with historic former Chinatowns in frontier and rural areas. Given the proximity to the Asian continent, Australia has had, and continues to witness, a massive immigration of Chinese and other Asians. The majority of ethnic Chinese immigrants to Australia are from Canton and Hong Kong. Chinese from various places of mainland China, Macau, Taiwan, Korea, Southeast Asia—especially Vietnam, Laos, Cambodia, Philippines, and Indonesia—and Latin America also settled Australia.